This page is dedicated to Jadwiga Goclowski, PhD, RN, for raising my awareness of the importance in taking care of ourselves before we can take care of others, and for her tireless efforts and outstanding contributions in the fields of Quality Assurance and Maternal & Child Health. 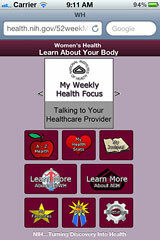 The purpose of this page is to provide an organized approach to finding basic information about the most common preventable health problems that plague women. It is my hope that you will find what you need fast and easy. This is by no means exhaustive, but I have picked those sites that I consider to be reliable. If you have any suggestions about what else I can include, please do not hesitate to E-mail me your suggestions. SALUD! Vote for this site "Social Work Search Engine"